This is the second fight for Benson Henderson vs Anthony Pettis where Pettis defeated Henderson in 2010 via unanimous decision. When you look at the video replay highlights Henderson vs Pettis inn their second encounter for the 4th title defense of Henderson for the Lightweight Title He earned from former champion Frankie Edgar. By defeating Henderson For the Second time, Anthony Pettis became the New UFC Lightweight Champion of the world. 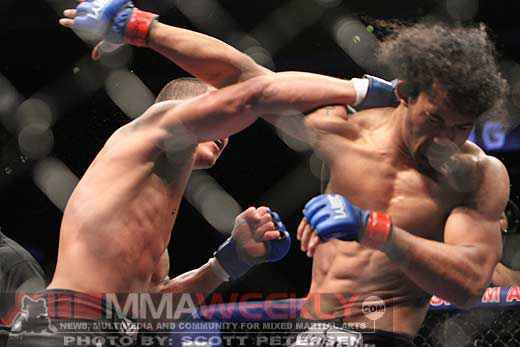 In this UFC 164 Lightweight Championship, it was expected that Ben Henderson would defend his titile against TJ Grant but Grant was forced from the bout citing injury and was replaced by Pettis. I hope you enjoy watching the UFC 164 main event lightweight championship between Henderson vs Pettis. What can you rate about this fight?